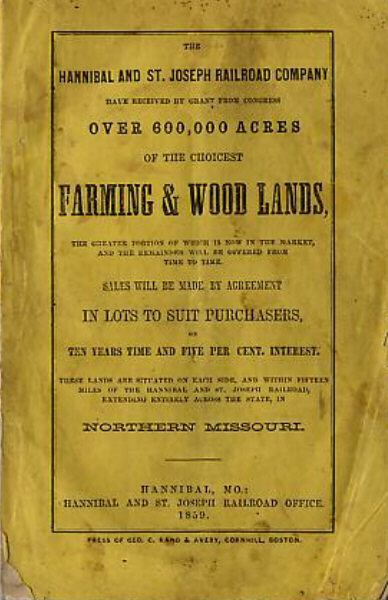 The Hannibal and St. Joseph Railroad Company have received by grant from Congress over 600,000 acres of the choicest farming & wood lands, the greater portion of which is now in the market, and the remainder will be offered from time to time. Sales will be made by agreement, in lots to suit purchasers. Ten years time and five percent interest. These lands are situated on each side and within fifteen miles of the Hannibal and St. Joseph Railroad, extended entirely across the state in Northern Missouri.